In the name of modern lifestyle, today we have become exploitative. Everything that nature offers us that have been overexploited. Industrialization and urbanization are damaging our environment and insensitivity of the human being is making the situation critical. Our Earth is often called a watery planet since the major portion of the Earth surface is covered with oceans. Every resource like the water of this planet has some utility for human beings but its utilization has to be done wisely. Like other resources, water is an important resource because all living beings need water for their existence. Plants, animals and human beings all need water for life. A very important use of water in our country is for irrigation for raising crop production. With the passing of time, river water become more polluted due to excessive growth of algae and bacteria by which BOD and nitrate increase and quality of the river water and aquatic environment including fisheries, flora and fauna and other living and non-living beings related to the river are affected, so it is necessary that this serious issue should be exhibit . Water pollution is also a potential danger for the human beings. Due to many reasons like heavy and harmful substances from many sources like factories, industries or the hazardous smoke released by the vehicles, garbage, and sewage from houses, agricultural runoff, cattle's bathing, etc. water on earth is becoming unfit for living beings. This has become a serious problem in the world today. In many of our daily activities like bathing, washing, cleaning etc. water is used by all of us. During these activities, many things like soap, washing powder, detergent and cleaning agents make fresh water unfit for drinking. Water used once in these activities again. Thus, the domestic activities are an important source of water pollution. This polluted water, when reaches in freshwater bodies like rivers makes the fresh water too polluted. We need good quality water for drinking. Also, we want to have clean sewage system to prevent unsanitary conditions. If sewage is allowed to join rivers, the pollution thus caused lead to spread of diseases. Epidemics like cholera, jaundice, and diarrhoea caused by contaminated water. The other diseases are malaria, dengue, and encephalitis caused by mosquitoes that breed in stagnant water. The water after the merging of polluted water is potentially hazardous for human health and proper cautions should be taken before the polluted water is allowed to merge with fresh water in order to save the biota dwelling there in form adverse effects . Ramganga is a tributary of Ganga, which originates from the high altitude zone of 800 m to 900 m and its journey at an elevation of 3,110 m. The impact of effluents discharged through industrial wastes and sewage into Ramganga and to observe the change in the quality of water . The length of Ramganga river is 155 km and catchment area of the basin is 30,641 km square. This river flows to the southwest from Kumaun Himalayas. It is carrying high sediment load causing frequent floods in major cities like Moradabad, Badaun, Hardoi, Bareilly, Shahjahanpur which are placed on the banks of Ramganga river of Uttar Pradesh and Approximately, 32,493 sq.km. is the catchment area of Ramganga basin. The first major tributary of the River Ganga is Ramganga basin and its length from the source to the confluence with the Ganga is 596 km. The river flows entirely in the states of Uttaranchal and Uttar Pradesh [4,5]. The important tributaries of Ramganga River are the Kho, the Gangan, the Aril, the Kosi, and the Deoha (Gorra) which are joined to river Ramganga. The main objective of any type of analytical monitoring program is to obtain analytical data which are clearly depicted system being studied. Thus, all the basic objective of analysis of a various type of water sample collected is to assess the potential in a region taking into consideration both quality and pollution aspects due to pollution . These villages are located near the bank of the river which also contributes towards pollution. These are not only those places that contributed to the wastes, even whole Bareilly city, and industrial units which are located around the river Ramganga. The proposed work had been taken to study the physico-chemical and biological characteristics of river Ramganga at Bareilly. To study the physico-chemical and biological characteristics at five sampling sites viz. A, B, C, D, and E are villages which are placed on Bareilly district map, from where water samples were collected in the month May and June of Summer season,2017 to study physico-chemical and biological characteristics. The samples of water were taken carefully from five sites in morning hours of the second week of month May and June during the summer season, 2017. Samples were handled in such a way that those didn't destroy or become contaminated before it reaches laboratory. Immediately, after collection of the samples, it was made possible to measure the water quality non-specific parameters such as pH and temperature. At the time of water sample collection, Transparency was measured by Secchi disk on all sites and total biomass was measured by filtering five litres water of sampling sites in measured wet cloths. Measurement of other physico-chemical parameters are temperature by thermometer (0C), pH by pH meter, turbidity (NTU) by turbidity meter, electrical conductivity (μmoh/cm) by EC meter, BOD (mg/L) by 5 days of BOD test, alkalinity (mg/L) by titrimetric method, dissolved oxygen (mg/L) by Winkler's method, calcium (mg/L) by EDTA titrimetric method, nitrate (mg/L) by UV spectrophotometer, TDS (mg/L) by Gravimetric method after filtration, total solids (mg/L) by Gravimetric method, COD (mg/L) by dichromate titration method and transparency (cm) were subsequently followed by Standard Methods (APHA, 1985) and employed to preserve the water samples, at least for 24 to 36 hrs. The analysis was completed without further delay. Physico-chemical and biological parameters: Among various physico-chemical and biological parameters attributes, temperature, transparency, pH, total solids, total dissolved solids, biological oxygen demand, chemical oxygen demand, electrical conductivity, turbidity, nitrate, calcium, and total biomass varied considerably from site to site as well as with changing in both months of summer season. Site-wise estimated values of thirteen physico-chemical and one biological parameter are presented with graphs in Tables 1 and 2. A critical analysis of the data revealed the following facts regarding river water quality at Bareilly. Table 1. Site-wise values of different physico-chemical and biological parameters in month May of summer season. Table 2. Site-wise values of different physico-chemical and biological parameters in month June of summer season. Temperature was in the range of 32°C to 33.2°C accuracy using a mercury thermometer, immediately after collecting the water sample. The variations in temperature are mainly related to the atmosphere's temperature and weather conditions and higher values of temperature during the summer season was due to greater heating. All column shows the site-wise (site A- Ajampur Balarau, site B-Ghura Raghavpur, site C-Sarai Talfi, site D-Uncha Gaon and site E-Kundara) physico-chemical and biological values of both month( blue column indicate to May month and red column indicate to June month) (Figures 1-14). 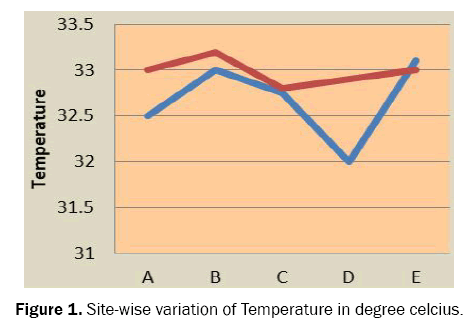 Figure 1: Site-wise variation of Temperature in degree celcius. 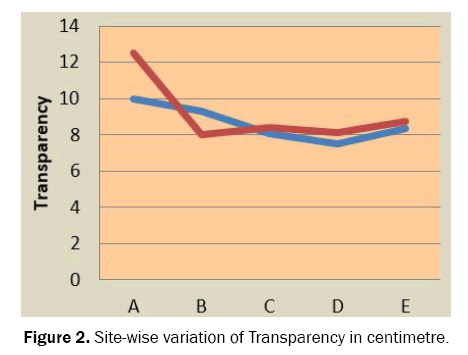 Figure 2: Site-wise variation of Transparency in centimetre. 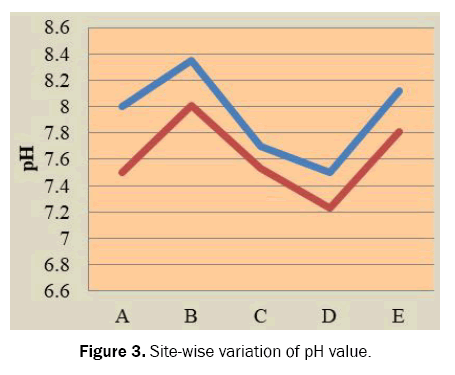 Figure 3: Site-wise variation of pH value. 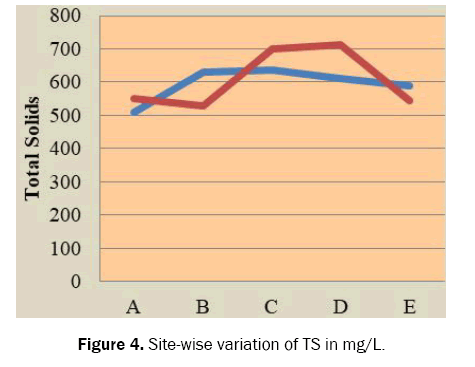 Figure 4: Site-wise variation of TS in mg/L. Figure 5: Site-wise variation of TDS in mg/L. 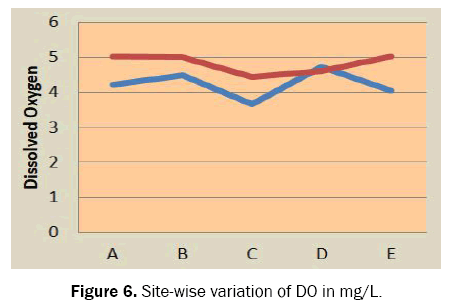 Figure 6: Site-wise variation of DO in mg/L. 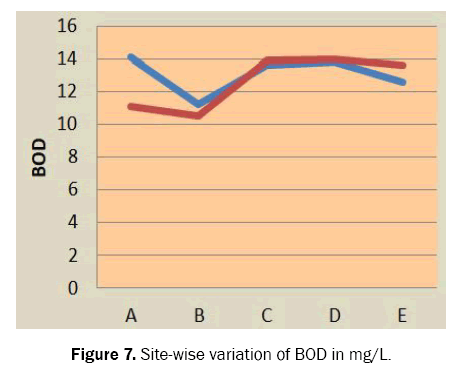 Figure 7: Site-wise variation of BOD in mg/L. Figure 8: Site-wise variation of COD in mg/L. 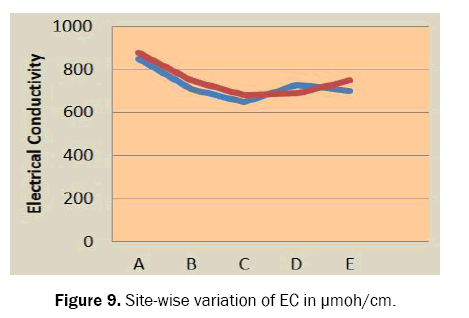 Figure 9: Site-wise variation of EC in μmoh/cm. 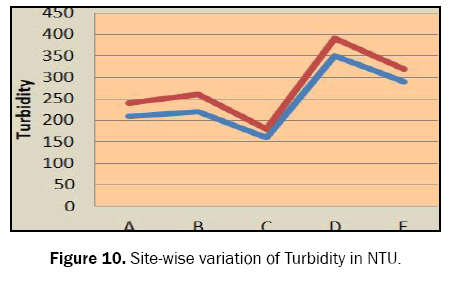 Figure 10: Site-wise variation of Turbidity in NTU. 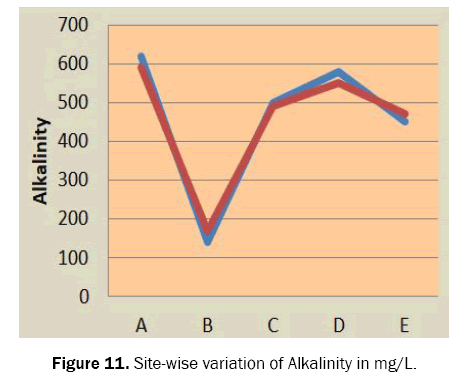 Figure 11: Site-wise variation of Alkalinity in mg/L. Figure 12: Site-wise variation of Calcium in mg/L. 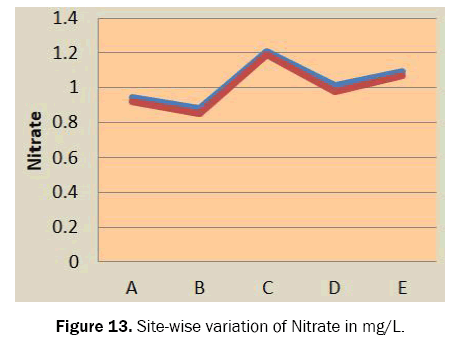 Figure 13: Site-wise variation of Nitrate in mg/L. 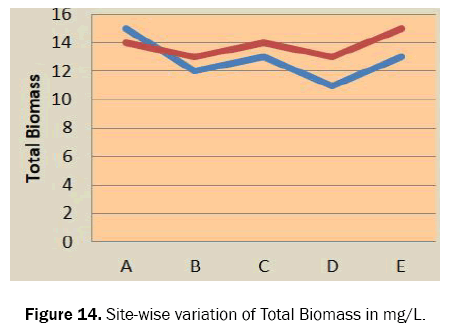 Figure 14: Site-wise variation of Total Biomass in mg/L. Transparency is a characteristic of water which varies with the combined effect of color and turbidity and measures the light penetrating through the water body. It is determined by using a Secchi disc. The transparency values in samples varied from 7.50 cm to 12.50 cm in the summer season. pH values determined for all the collected water samples from sites were found in the range of 7.23 to 8.35. pH of river water reveals that a solution is acidic or alkaline and pH can be used as an indicator in the detection of any serious deterioration of the aquatic flora and fauna which give an idea about quality and intensity of water pollution. Total Solids analysis has great implications in the control of physico-chemical and biological wastewater treatment processes. It is determined by the Gravimetric method in this study ranged from 510 mg/L to 700 mg/L in the summer season. The high amount of TS may be attributed to use of salts during dyeing processes. Total Dissolved Solids observed values ranges from 220 mg/L to 660 mg/L in the summer season by Gravimetric method after filtration. TDS analysis has great implications in the control of biological and physical wastewater treatment processes . Dissolved Solids values are an indication of pollution in water and depict an inverse relationship with water temperature. Collected water samples from all sites were found to contain DO levels ranging from 3.67 mg/L to 5.02 mg/L. DO can be decreased in water due to microbial activity, respiratory and organic decay. Biological Oxygen Demand observation of five sites in both month of summer season varies from 10.5 mg/L to 14.1 mg/L by 5 days of BOD test. BOD used as the measurement of a number of organic materials in aquatic bodies which supports the growth of micro-organisms. Chemical Oxygen Demand is useful in pinpointing the toxic conditions and presence of biochemical resistance. 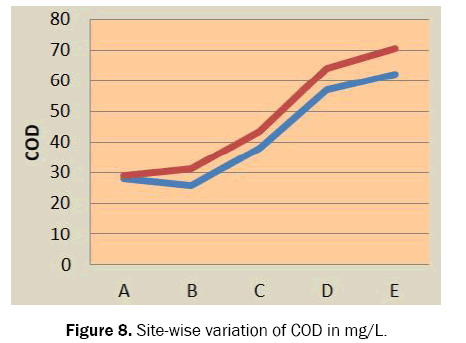 In the present study, COD was recorded ranging from 25.9 mg/L to 70.6 mg/L by dichromate titration method in the summer season. Electrical Conductivity influenced by the presence of ions in the form of dissolved solids and the ion level rise due to the rise in pollution load . EC values in the present study were found ranging from 650μmoh/cm to 880μmoh/cm in the summer season by EC meter. Turbidity of any water sample is the reduction of transparency due to the presence of particulate matter such as lay or slit, finely divided organic matter, plankton and other microscopic organisms . Turbidity values varied from 160 NTU to 390 NTU in the summer season which increased the probability of the presence of pathogenic organisms in turbid water. Alkalinity is influenced with carbonate, bicarbonate and other ions. The value of alkalinity varies from 140 mg/L to 590 mg/L in the summer season and it is determined by the titrimetric method. The high concentration of sewage and industrial waste may be the cause of high alkalinity . Calcium is the most abundant ions in fresh water which is important in shell construction, bone building and plant precipitation of lime. The analysis of calcium revealed a range between 15.10 mg/L to 26.02 mg/L and it is determined by EDTA titrimetric method. Nitrate's main sources in rivers are decaying legumes. But a large amount of nitrate also originates from oxidation of human and animal excreta. Effluents from sewage treatment facilities are also the main contributor especially if the treatment facility lacks a denitrification process . In the present study, observed nitrate values range from 0.85 mg/L to 1.21 mg/L in the summer season. Total Biomass is the total mass of living material and dead organic matters . The analysis of total biomass revealed a range between 11 mg/L to 15 mg/L in the summer season. Biomass is the amount of this accumulated material at a given moment, but in a river system, biomass may be lost by export such as downstream transport or gained by import from other systems such as leaves falling into river water. The above studies are conclusive of the fact that Increasing population, urbanization, and industrialization along the rivers have put extreme pressure on resources of the water, and water quality. The problem of water quality deterioration is mainly due to human activities such as disposal of dead bodies, sewage, domestic waste and industrial and agricultural effluents, etc. which are major cause of ecological damage and pose serious health hazards. Industrial revolution has significant causes on floral and faunal incapacitation and total deterioration. It may be concluded that water of Ramganga river is polluted with organic and with reference to physico-chemical and biological parameters studied. River Ramganga is losing its water quality day by day. River water is not suitable for drinking, domestic and industrial as well as irrigation purposes with respect to physico-chemical and biological parameters. Now, it is necessary to control the river water pollution at Bareilly. Singh, Prity, et al. Physico-chemical and biological characteristics of river Ramganga at Bareilly. Inter J Curr Res. 2017;9:62249-62252. Chandra R, et al. Monitoring of river Ram Ganga: Physico-chemical characteristic at Bareilly. Recent Res Sci Technol. 2011;3:16-18. Channdra R, et al. Pollution status of river Ramganga: Physico-chemical characteristics at Bareilly. J Exp Sci. 2010;1:20-21. Bhutiani R, et al. Physico-chemical analysis of sewage water treatment plant at Jagjeetpur Haridwar, Uttarakhand. Environ Conservation J. 2016;17:133-142. Alam M, et al. Rapid assessment of water quality index of Ramganga River, Western Uttar Pradesh (India) using a computer programme. Nat Sci. 2010;8:1-8. Sinha DK, et al. Seasonal variation in the aquatic environment of Ram Ganga river at Moradabad: A quantitative study. Indian J Environ Prot. 2006;26:488-496. Gangwar RK, et al. Assessment of water quality index: A case study of River Ramganga at Bareilly UP India. Int J Sci Eng Res. 2013;4:2325-239. Sayeed A, et al. Characterization and influence of rainy season on ground water quality of Moradabad city. Int J Adv Res. 2017;5:335-338. Srivastava A, et al. Water quality assessment of Ramganga river at Moradabad by physico-chemical parameters analysis. VSRD-TNTJ. 2011;2:119-127. Gangwar RK, et al. Assessment of physico-chemical properties of water: River Ramganga at Bareilly, UP. J Chemical and Pharmaceutical Research. 2012;4(9):4231-4234. Khan MY, et al. Factors responsible for temporal and spatial variations in water and sediment discharge in Ramganga River, Ganga Basin, India. Environ Earth Sci. 2016;75:283. Prity Singh, et al. Physico-chemical and biological characteristics of river Ramganga at Bareilly. Int J Dev Res. 2018;8:19198-19201.